Chris Parker, Halls High School head football coach, has found a way to keep his players both safe and happy. Parker’s players endure dangerously hot days, as well as the rain and cold, in order to practice. So he plans to build an indoor training facility to benefit the entire sports program. It will take the support of the entire community to make it work, he said. The indoor facility will be built with donated money, not taxpayer money. Parker knew that it would be difficult to secure enough funds to create an indoor facility that would accommodate all of the needs of the school, but he was determined to try. Though funding and building a $350,000 indoor sports facility seemed daunting at first, the community has jumped on board and now over half of the funds have already been donated. The 23,000-square-foot facility will be large enough to accommodate three different sports teams practicing at once. 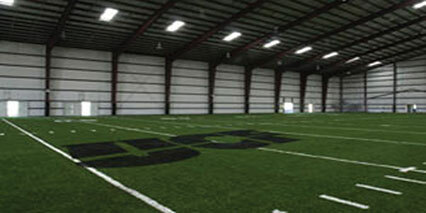 Features include a turf field with football and baseball and softball lines, batting cages, storage rooms and bathrooms. The facility won’t just benefit the school; it could be used to bless the entire community, said Parker. For example, he foresees the facility being used by community sports teams such as peewee football and community baseball and softball teams. Parker also imagines a day, possibly 20 years in the future, when donors are able to come back with their children or grandchildren and show them the investment that they made in Halls High School. Parker is considering commemorating those investments by creating a brick pathway with donors’ names engraved on them. Traditionally, the Halls High School sports program has excelled, said Parker. The football and baseball teams have both made state tournament appearances, and the football team has also made it to the state playoffs. But Parker has heard too many times from his football players about the advanced facilities they have seen while visiting other schools. Anyone interested in donating or getting more information about the project should contact Chris Parker at cparker@lced.net or 731-334-0660.